An exciting annual event for Australian manufacturers and engineering service providers – National Manufacturing Week (NMW) 2013 is around the corner and this year, it will be held right here in Melbourne where Bestech Australia head office’s located. Bestech Australia will present its comprehensive product line with impressive working units on site and demonstrate to visitors by extensive experienced sales engineers. Visitors can expect to explore our high precision laser measuring sensors, online colour sensors, infrared temperature sensors, inductive LVDTs and draw-wires, high capacity load cells and pressure sensors with OEM and miniature options, strain gauges of all types, accelerometers with various technologies, geotechnical engineering devices, multichannel data loggers and data acquisition systems, package leak testers, pressure vacuum leak detectors, universal material testing machines (UTMs), differential scanning calorimentry (DSC) material thermal analysis instrument, universal calibrator, signal converters and digital display panels. An 18m2 stand allows Bestech Australia to display most of our STAR products in Australia and provides the opportunities for participants to conduct measurements on specimen. 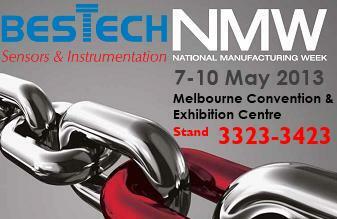 Bestech Australia will be located in AUTOMATION & ROBOTICS and we will be glad to meet you at our booth: 3323 – 3423.